FORT WAINWRIGHT, Alaska -- (June 8, 2012) Some had just arrived at Fort Wainwright and were there to jumpstart their great Alaskan adventure. Others just wanted to get out of the house and maybe catch a picture of some sort of wildlife. Whatever the reason, ten women and two leaders crawled out of their beds early on Saturday morning, June 2, to participate in the Outdoor Recreation Center's Women in the Wilderness program at Fort Wainwright, Alaska. As part of the program, the center offers activities exclusively for women in hopes of getting them outdoors, possibly trying something they have never done before or something they may not have felt as comfortable doing in the company of men. 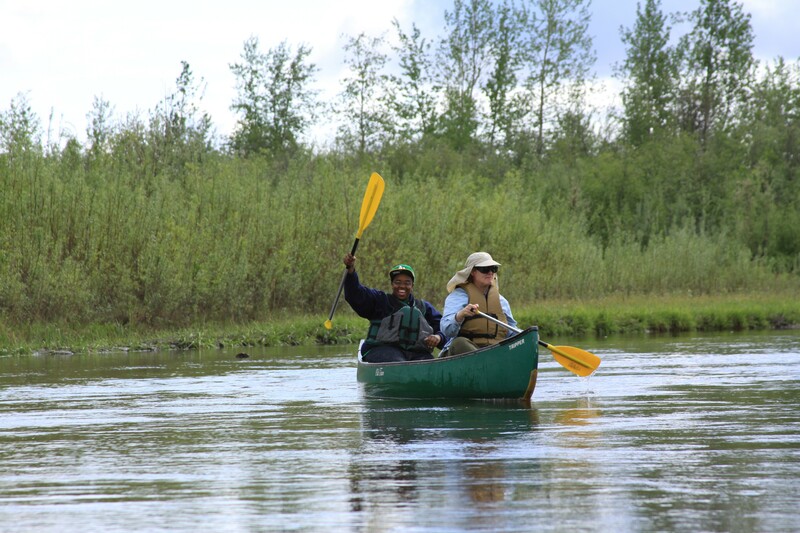 Saturday's adventure was a float down the Chena River using canoes or kayaks. Mary Bush, wife of Spc. Jimmy Bush 1st Stryker Brigade Combat Team, 25th Infantry Division arrived in April. She was happy for the chance to get out of the hotel with the friend who had invited her. She considers herself an outdoors person and had even worked at a kayak store at one point of her life and wasn't the least bit nervous about the adventure. However, Jordan Sanford was, having no previous experience she decided to do it anyways. She thought it might be one of her last chances before she and husband Spc. Victor Sanford, 25th Brigade Support Battalion, 1-25th SBCT leave Alaska in the fall. Her primary goal was to see some wildlife and get some pictures. "It was so much fun" she said after she returned. "It was really, really pretty and relaxing." Not only did she get to see some beautiful scenery along the river, she got close enough to a beaver swimming up river to take its picture. There will be plenty of opportunities for fun and photographs on upcoming trips, which include the Women in Wilderness mountain hike on July 14 and Women in the Wilderness rock climbing August 4. For more information call 361-2652.